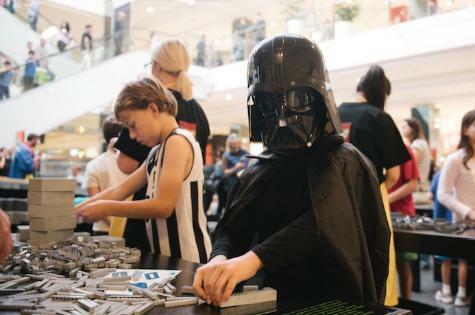 LEGO Australia and Star Wars fans are invited to help build one of the most iconic vehicles from the Star Wars saga, the Death StarTM, at Westfield Warringah on Saturday 29th and Sunday 30th April. Master Your Force to Build and join LEGO Master Builder, Chris Steininger in creating the southern hemisphere’s biggest Death Star out of LEGO bricks to celebrate international Star WarsTM Day, ‘May the 4th Be With You’, and the 40th anniversary of the first ever Star Wars film. One of only seven LEGO Master Builders in the world, Chris has flown over from the US to lead Aussie fans in the build of the infamous Death Star, the Empire’s ultimate weapon. The Death Star will measure an impressive 2.4m in circumference and will use 210,000 bricks and weighs 545kg, making it the biggest Death Star model ever built from LEGO bricks in the southern hemisphere! Just like hero Luke Skywalker, visitors will be able to destroy the Death Star thanks to incredible augmented reality technology, which will see the Death Star explode into hundreds of LEGO bricks right in front of your eyes! Fans will also be able to meet members of the 501st Legion, battle it out with Star Wars trivia, win prizes for best dressed, and leave with a miniature build from the event. They are invited to share in the fun by sharing their experience on social using the hashtags #Maythe4thbewithyou, #StarWarsDay and #StarWars40th. Be a part of history as we lay the final bricks on this epic build at 2pm on Sunday 30th April. The finished LEGO Death Star will be open for public exhibition for fans who wish to have their picture taken with the model until Friday 5th May. So Master Your Force to Build with LEGO Star Wars this May the 4th! What a fantabulous post this has been. Never seen this kind of useful post. I am grateful to you and expect more number of posts like these. Thank you very much visit us.